I have put a lot of effort into advertising this computer as well as possible on my own website, so please excuse me for not pasting all that information over here. Someone needs to school you on how to sell a computer. Try buying a car under these conditions ... "Please don't ask for the price"
As the saying goes, "If you have to ask for the price, chances are, you can't afford it" ... Certainly true here. Do not just post a link and leave people to guess what you're selling. You've done that twice here now, and with the same result. If you can't post a price, then don't post the item. if he guesses the value that high - why not put it in a normal auction house ? 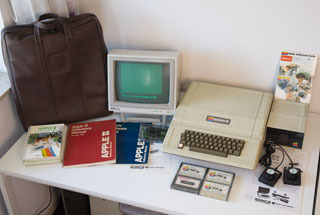 So lets get this straight you are trying to sell a apple II rev 0 for 16384 euro's. Converted to USD that is $19279.95, I have never seen an apple II that was a rev 0 sell for anywhere near that price, and that does not include shipping and customs fees, but that's beside the point. please, read the rules on this forum, post the price clearly so we don't have to go to your website and find it. I am shocked it sold for this much!!! I have a similar albeit slightly "newer" Rev 0, with all of the components (early paddles, cassette tapes, red & blue books, carrying case, metal toggle switch PSU, bright green expansion slots, correct keyboard, etc) and heck I'd consider selling it for that amount!! Not sure that it really sold for THAT amount he initialy demanded. Very unlikely it was sold for more than 5-6K. IF it was sold... - Everyone can write a lot. Last 2 years you could buy Rev. 0 (low serial number) even in a lower price range. I bought some Rev. 0 last 2 years and still will buy in the usual price range.